The following is good information to know if you use a septic system for waste management for your home or business. Following these suggestions will help maintain your septic system and keep it in good working order. Liquid laundry detergent works best. Powdered laundry detergents use clay which can hasten the buildup of solids in the septic tank. This can potentially plug the disposal area. Minimize the amount of household cleaners. Excessive quantities can be harmful. Normal use of detergents, kitchen waste, laundry waste and household chemicals should not affect the proper operation of the household sewage treatment system. Keep a record of the location of key parts of the septic system. This will help with field repairs or when the septic system is pumped. 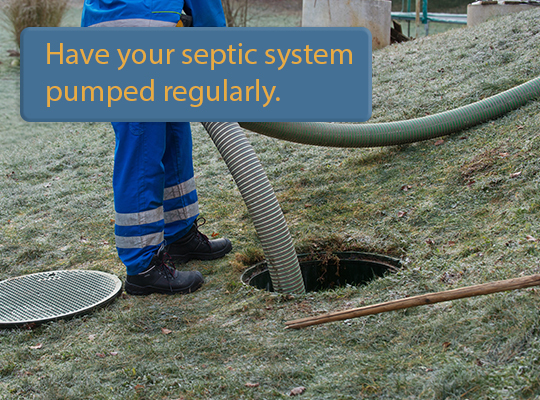 Have the septic system pumped regularly. Pumping should be done every 2 to 3 years or when total depth of sludge exceeds one-third of the liquid depth of the tank. If the tank is not cleaned regularly, the solids are carried into the absorption field. Rapid clogging occurs. The leach field may need to be replaced at a much higher cost than pumping. 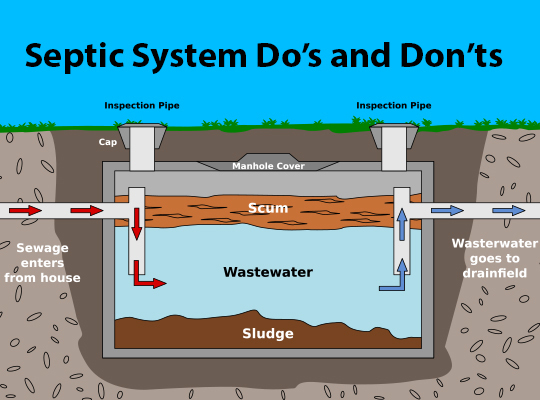 The septic system should be cleaned through the manhole in the center of the top of the septic tank, not the inspection ports above the inlet and outlet baffles. Keep good records of septic pumping service and maintenance. Pumps, siphons and other moving parts should be checked regularly. Whenever possible use water-conserving devices. Install low water usage appliances, low flush toilets, and shower heads. These fixtures can reduce the amount of water used entering the septic system by 20,000 gallons per year. Remove trees with large root systems. Roots growing in the immediate area of the absorption lines may clog the system. Check your interceptor drain regularly. It should be free-flowing. Avoid build-up of noxious gases. Gases can build-up in unused drains. Run water regularly in sinks that are seldom used to prevent odors from coming inside. Keep roof downspout drainage away from leach field. Drainage water from the roof, cellar and footing drainage and surface water should drain away from sewage treatment system. Discharge Water Softeners separately. Water softeners can damage your leach field. Backwash from water softeners contains salt and should be discharged to a separate system or to the ground surface. Keep Swimming pools (above or in-ground) away from the leach field. Don’t do too many loads of laundry in one day. Having a “laundry day” can put a severe strain on the septic system. Space out loads of laundry over the week and always do full loads. An average load of laundry uses 47 gallons of water. This adds up quick when doing 7 loads in one day. Top loading washers tend to use more water than front-loading washers. Don’t use garbage disposals. These can increase the accumulation of solids in the septic tank, as well as the solids entering the leach fields and pits. It is not recommended to use a garbage disposal if your home has a septic system. If you do use a garbage disposal, have it run through a separate trash tank. If you use a garbage disposal, you should pump more frequently. Don’t let these items go into the septic tank and leach fields. 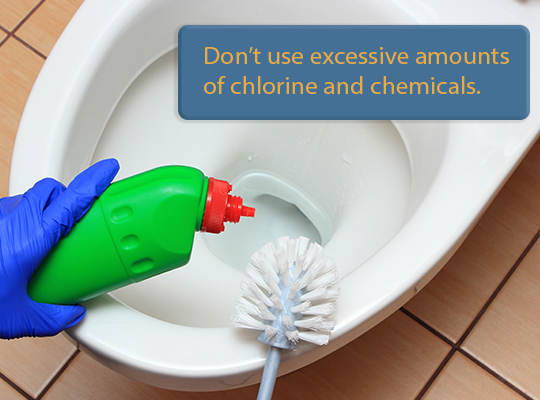 Don’t use excessive amounts of chlorine and chemicals. A good formula for a bacteria cleaner is 1 part chlorine to 5 parts water. Avoid water from leaking fixtures and toilets. Dye test toilets to check for leaks in the septic system. Don’t use hair conditioners with heavy oils. These should be avoided entirely if they are not bio-degradable. Compensations can be made by adding or using different bacteria in the septic system. Kitchen greases should stay out of the septic system. It is not easily broken down and can clog your drain field. There are no available solvents to dissolve these oils that are legal to the groundwater. Septic tank additives are not recommended. Additives are unnecessary and may cause the sludge and scum in the septic tank to be discharged into the leach field. Some additives will pollute the groundwater. The normal human waste contains enough bacteria for the septic tank. Other microbes are already present in the soil and stones of the disposal area.